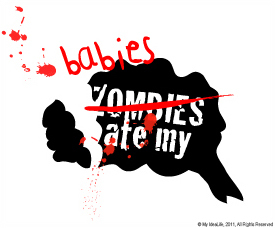 I bring you again a topic close to my heart, or more accurately my head; Baby brain. It seems I am destined to suffer immeasurable vagueness and memory loss way past the time the experts say normal brain function will return, that is 6 months after birth. I’m going to take the liberty of forming an opinion based on no research whatsoever, and say you can multiple the 6 months by the number of children you have. By that calculation I should have my brain restored in around 6 weeks. That is, if baby brain is what I am suffering from. All evidence points towards some grey matter removal so unless my brain has been eaten by Zombies or I accidentally gave birth to half a brain per baby, both very viable possibilities, I am hoping to not have a day like today again after September. It wasn't as bad as this day from hell but how a simple grocery shop can epitomise your life would have been beyond me two years ago, but not now. The Coles red finger* pushed me down a little further when unbeknown I chose a checkout guy in training, again a nice person, but wanted my reassurance on every bag he packed ‘Is this too heavy Mam?’, ‘No it’s fine’ (subtext: less on the 'Mam' and more on the hurry the f**k up do you not hear this baby screaming). The final cost of the groceries again edged me a little lower as despite millions of dollars spent filming ridiculous *people holding huge red fingers while singing ‘down down prices are down’, my grocery bill has mysteriously increased by about 20%. No wonder people are putting bananas through the self-scan aisles as carrots^. Instead I race to the car, pack my million dollar grocery haul all the while shoving very convenient healthy potato sticks into Crashes mouth to keep it otherwise occupied. I rolled into the garage at home with a big sigh of relief before loading myself up to the point where my hand was about to spontaneously drop off by the time we got to the front door. With Crash precariously balanced on one hip, I ferreted around for the keys, shuffling through the 8 or so that weren’t the front door key and then KAPOW! My brain recalled a memory. You could say quite a key memory (pardon the really bad pun), a memory that would have best been recalled around 20 minutes earlier, (I use the word 'recall' quite liberally here as there's something about being locked out of your house with nine thousand bags of shopping and a ten month old that has a strong tendency to jog the memory). The house keys were with Mr Shu-fiks. who had two hours earlier cut me a second set that were patiently waiting for me along side the old set under the counter at the shopping centre. I heard recently that swearing was not appreciated by all so you will have to just imagine the swear words that exited my mouth at that moment. And I’m not a big swearer, oh no that’s right I am, so think bogan-who-just-shot-himself-with-a-nail-gun-type swearing and you are about half way there. In any case Mr Shu-Fiks got a new name with the simple substitution of the letter U. Anyway a second trip in the car for a tired and hungry baby plus a surprisingly content ten month old ended my daily woes and really were nothing a coffee, cup cake and a good collapse on the sofa couldn’t solve. But enough now with this baby brain shite - if I can remember my credit card number why on earth can't I recall picking up the keys that open the door to a building that contains shelter, warm cots and now quite a lot of expensive food? So until my brain returns it is online shopping, even with the old fruit and inflated prices, at least all I have to remember then is to be home when it arrives...oops. Illustration not to be reproduced without express permission of the illustrator, contact info@myidealife.com.au for more information.